Soup time is around the corner in Seattle! Start off fall right with this easy and delicious vegan soup recipe! 3 oz firm tofu, drained and pressed. cut into small 1/2-inch square cubes. 1. Cook about 1 serving of noodles (any Chinese noodles, thin or wide). After the noodles are cooked, put it in a bowl. Dress it with 1 teaspoon of sesame oil, 1/2 teaspoon white pepper, 1 teaspoon black vinegar and 1/2 teaspoon soy sauce. Mix the noodles in. You can actually snack on it alone. It’s a very basic Taiwanese noodle snack dish. 2. Boil water, add no-chicken base or vegetable broth. Let it boil. 3. Add carrots and shiitake mushrooms, cook for 2-3 minutes. Add soy sauce, red chili paste (or garlic chili paste), white pepper, sea salt, chili flakes. 4. Add diced tofu, napa cabbages and frozen peas. Cook for 2-3 minutes. Add sesame oil, black vinegar. 5. Dissolve the cornstarch in the water and stir until smooth. Mix that into the soup and continue to simmer until thickens. Add more cornstarch if the soup is not thick as it should look. 6. Garnish the soup with chopped green onions and cilantro (optional: pickled Chinese cabbage). 7. Pour the soup over the noodles in the bowl. 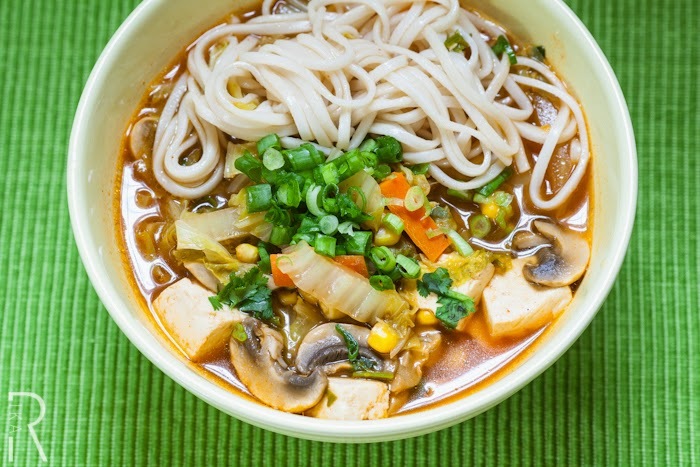 Happy Noodle Soup Day!